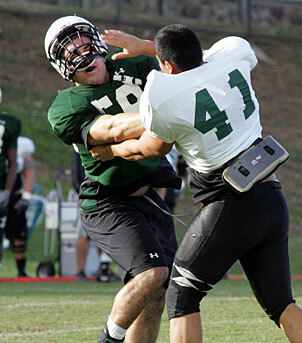 Corey Paredes, right, lost his helmet during a kickoff drill yesterday and tried to return the favor to Josh Andrews. Ikaika Malloe is looking to fill some jobs, and the timid need not apply. "We're looking for the five craziest guys on this field," the Hawaii special teams coach repeatedly shouted as the Warriors worked to shore up their kickoff unit. Head coach Greg McMackin highlighted the Warriors' special teams play as an area of concentration this week following a three-game stretch that left Hawaii 111th in the country in kickoff return yards surrendered. In their return to practice yesterday, the Warriors held full-speed tryouts for the "wedge buster" group - a gang of five charged with tearing downfield to break up the wall of blockers leading the way for the returner. "We had 20 guys trying out for five spots and we're going to find the five craziest guys," Malloe said. "It's a headache job, but I love it," said reserve running back Corey Paredes, who lost his helmet in a jarring collision with linebacker Josh Andrews during the drill. Malloe pointed to one of the Warriors' smallest players, freshman defensive back Richard Torres, among those who stood out yesterday. At 5-foot-7 and 165 pounds, Torres has established a place on the two-deep by being technically sound to make up for his smaller stature and hopes to work his way onto the field on special teams. "When you're a small guy you cannot be scared. You just have to use your heart and go all out," Torres said. "If you're scared, you're just going to get hurt. Might as well go all out. "It's open for everybody, so you just have to do your best and go full speed." Torres is also running with the second team at nickel back on defense and came up with an interception in 7-on-7 drills and forced a fumble in the team period. Senior Dan Kelly and freshman Brett Symonds rotated on kickoff duty in the coverage drill. McMackin said senior quarterback Tyler Graunke will rest his sprained wrist this week and is hopeful he'll be ready to play against San Jose State. In the meantime, juniors Inoke Funaki and Greg Alexander split the snaps in the 7-on-7 and team periods yesterday, which were devoted to third-down situations. The Warriors ran sets of four plays - third and 3, 6, 10 and 13 - with the defense getting the better of the action for most of the morning. The defense "won," or prevented a first down, on 20 plays in the 11-on-11 team period, and the offense converted seven times. Greg Salas was the most productive of the UH receivers, picking up three first downs. Safety Erik Robinson had an interception of a deep pass and linebacker Po'okela Ahmad picked off a throw tipped by defensive end Elliott Purcell. Running backs Leon Wright-Jackson and Daniel Libre, who were also injured against Oregon State, didn't practice yesterday. Linebacker Adam Leonard also took some time off from practice. Sophomore quarterback Brent Rausch sat out due to illness. The Warriors will hold their annual Scout Bowl, a bye-week tradition, tomorrow morning. McMackin said the team will practice for an hour then devote the second hour to the scrimmage for the younger players and reserves.